Liver tissue samples from WT (W1, W2, and W3) and Hectd3–/– mice (H1, H2, and H3) on day 2 after infection with F. novicida and uninfected WT (W) and Hectd3–/– (H) mice were homogenized, and lysates were analyzed for activation and expression of caspase-3, caspase-1, caspase-11, ZBP1, and HECTD3, and phosphorylation of IκBα, STAT1, and STAT3. GAPDH was used as loading control. Each symbol indicates an individual mouse. β-Catenin and pGSK-3β proteins levels normalized to β‐Actin (40 KD) after 8 hrs of incubation in NTM cells following exposure to different concentrations of ODM and RPE EVs. Total protein was extracted from NTM cells and analysed by Western blot. Immunoblot analysis of liver samples from WT-Con (n=2), WT-ETOH (n=6), and Tg-ETOH (n=6) mice exposed to the chronic (6 weeks) ethanol containing diet protocol. phosphatase inhibitors are bought from Bimake (Cat# B15001). The expression levels of EMT-associated markers in miR-616-3p overexpression or knockdown cell lines were detected by Western blot analysis. Protease inhibitor is purchased from Bimake. 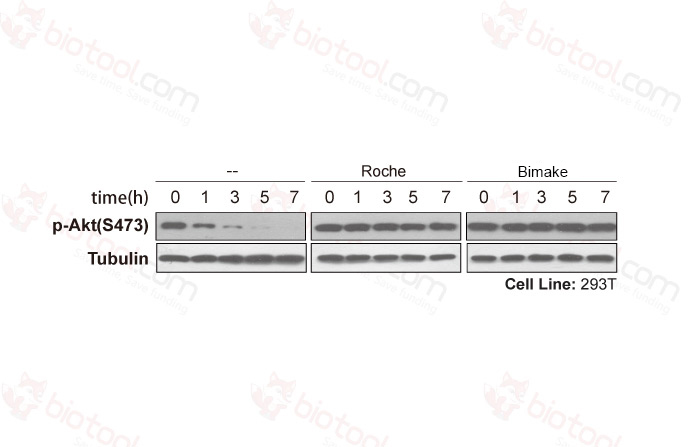 Western blot was used to detect the protein level of Regnase-1 in NIH3T3 cells treated with BRD4 inhibitor JQ1 and I-BET-762. Protease inhibitor (Bimake, Cat# B14001). Western blotting evaluated the expression levels of AKT, p-AKTT308, and p-AKTS473 in si-LINC00470-transfected GBM cells. Protease inhibitor cocktail (Bimake, B14001) and phosphatase inhibitor cocktail (Bimake, B15001). Knockdown of SMYD2 by siRNAs impaired SMAD1/5 phosphorylation induced by BMP2. HaCaT cells were transfected with SMYD2 siRNAs (siSMYD2-1 and 2). 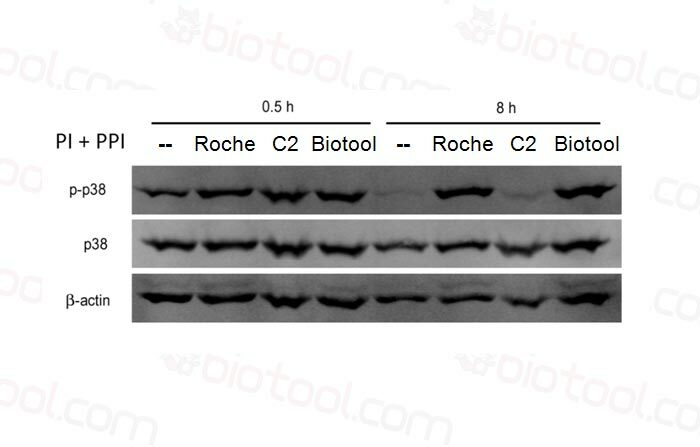 Two days later, the cells were serum starved overnight and stimulated with BMP2 for 0, 15, 30 and 45 minutes as indicated, and the levels of SMAD5, phosphorylated SMAD1/5 (SMAD1/5ph) and SMYD2 were analyzed by Western blotting. GAPDH was shown as the loading control. Bimake cocktails protect phosphorylated AKT and ERK better than their competitor. The 100X solution performs as well as Roche tablets in protecting total and phosphorylated p38. 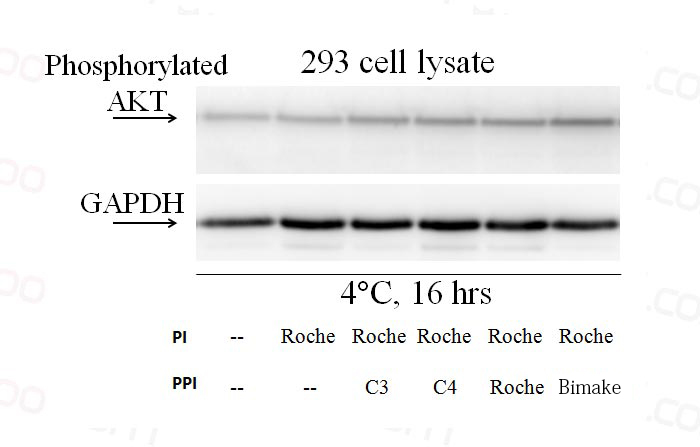 Bimake cocktails allow for detectable phosphorylated AKT after 7 hours of immuno-precipitation. Bimake inhibitor cocktails perform the best as compared to their competitors! 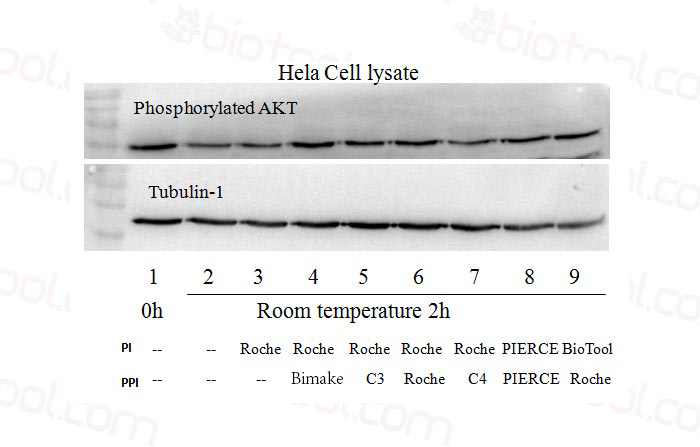 Bimake allows for detectable phosphorylated-AKT for 7 hour incubation at room temperature in 293 cells. 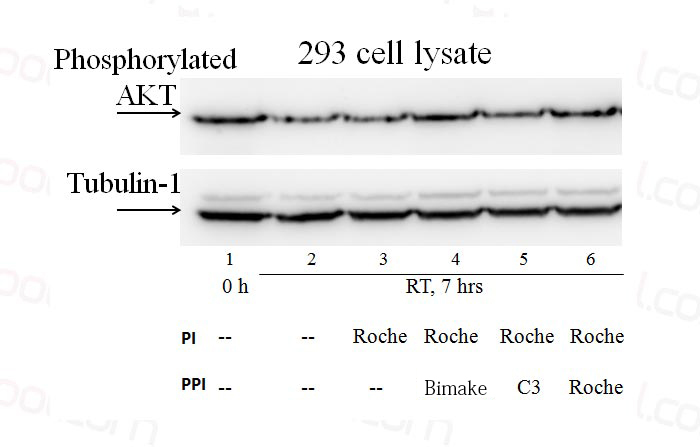 Bimake allows for detectable phosphorylated-AKT for 16 hour incubation at 4 degrees in 293 cells. For Phosphorylation Protection, more inhibitors mean better results. So we provide Two Tubes with 8 inhibitors. Phosphorylation of proteins and lipids is a hallmark of the signaling or metabolic status of cells. For decades, researchers have used easily-accessible phosphate mimetics (tube A) to prevent the loss of phosphorylation on biomolecules in vitro. In recent years however, a number of naturally derived agents (tube B) have been discovered as potent inhibitors of phosphatases, thus increasing the available protection spectrum. The product should be stored at -20°C, and is stable for up to 2 years. When kept at 2-8°C, the product remains stable for 2 months. Application Fields Western Blot analysis, Co-IP, pull-down, IF, IHC, kinase assay and etc. Experiment Protocol Thaw at room temperature. Before assaying, add each solution at 1:100 (v/v) dilution to samples (such as cell lysates or tissue extracts). Mix the sample sufficiently after each time of addition. 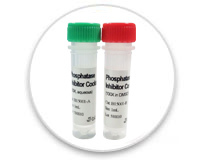 For optimum protection of phosphorylated proteins and lipids, we recommend simultaneous use of BOTH Tubes A and B. Because the inhibitor cocktails target different families of phosphatases, synergistic stabilization effects are observed with dual-treatment. The Phosphatase Inhibitor Cocktail does not contain protease inhibitors. Therefore,we recommend that a protease inhibitor cocktail is added beforehand. Protease inhibitor cocktails are frequently used in mammalian cell lysates or tissue extracts to increase protein stability. As the name indicates, the cocktail functions to inhibit proteases that would degrade either phosphorylated or non-phosphorylated protein substrates. Q#1: Weak western bands for both phosphorylated and non-phosphorylated proteins. A#1: Add a protease inhibitor cocktail beforehand to protect all kinds of proteins. Bimake provides high quality protease inhibitor cocktails at competitive prices. Q#2: Light-green sediment precipitated after mixing two tubes before use. A#2: This sediment is mainly salt precipitation. Salts in the aqueous tube and natural compounds in the DMSO tube will both be influenced by mixing. The precipitate cannot be completely re-dissolved and mixing the two tubes should be avoided. Separate addition of the two tubes is required as described in the instructions. Q#3: Tube B takes a long time to melt. A#3: This is because DMSO thaws very slowly, especially in low temperatures. Thawing in 25℃ water bath is recommended. Dividing Tube B solution into 100ul aliquots can shorten the thawing time.